When I was a little girl, I was doll crazy. I dressed my dolls obsessively, and I was lucky enough to have an Aunt Mel who loved to make doll clothes for my girls. I sat them around the picnic table and taught them; and I became a teacher. I invited them to tea parties and cooked for them in my doll kitchen; and I became an avid home cook and dinner party hostess. I read to them and became a reader. I drew with them and became an artist. What I am now, I learned by acting on The Doll Stage. The Way of the Doll quote is from Rainer Maria Rilke, the great German poet who thought quite a bit about dolls. The art is made using the Bazaart app for iPad. has to come and make the stuffed skins startle into life? My most beloved doll was a Betsy McCall doll. I took her on our family vacation to Glacier National Park. One morning, I got her all dressed for the day’s adventure over the Going to the Sun Highway and arranged her in a little tableau under a huge old oak tree. Lost Betsy. I made this image just this week. At age 65, there is some inner compulsion to return again and again to the scene of the crime; the crime of abandoning a loved one to the wilderness. 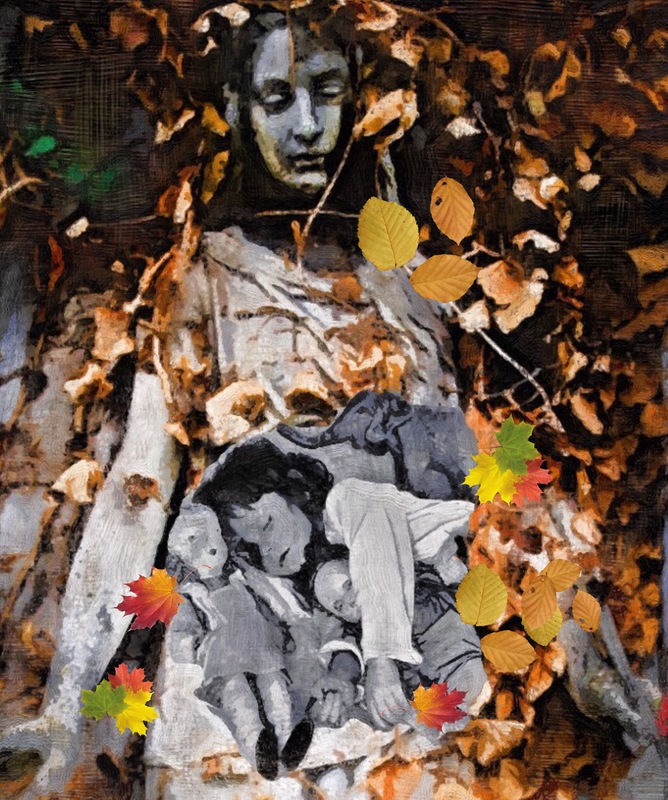 I began with two of my photographs, collaged it in the Bazaart for iPad app, then used the “Purts” setting in the Virtual Painter app for the painterly quality. In the kerfluffle of departure, I forgot her until we were high on the pass, and then the parents said it was too late to go back for her. I was heartbroken. My mother, now age 89, has so many times told me one of the few regrets of her well-lived life was that they didn’t go back for Betsy. In my memory, Betsy is still there, waiting for me. I have returned to Montana three times over the span of the ensuing five decades, and each time I have gone to that tree to look for her. At age 65, there is some inner compulsion to return again and again to the scene of the crime; the crime of abandoning a loved one to the wilderness. 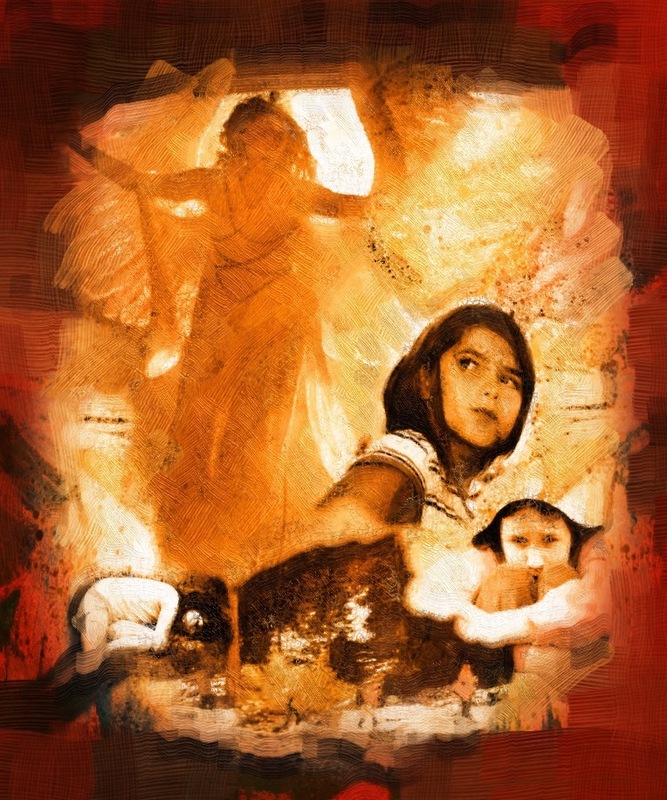 The Angel of Lost Children. Bazaart collage and “Purts” setting in Virtual Painter. Why does a doll, an inanimate object, hold such a place of psychic charge, of emotional power on The Doll Stage of my soul? She was my first loss; she went ahead of me and created the Room of Inconsolable Grief that is now always there just off stage. Betsy lives there in the good company of my father and a black dog named Fianna. Dolls occupy a liminal space between the rational and the irrational, between form and its shadow, between daylight and dream. 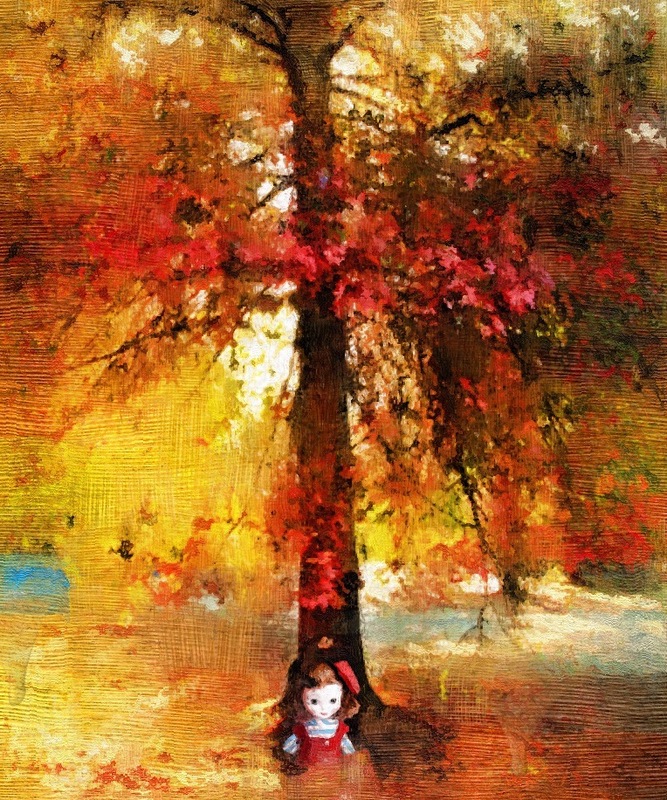 The psychodramas of childhood doll play became the dark well of Mystery that I draw on daily in my art, in all the details of a passionate life lived for and in art. “The Time Travelers Appear Before Me On the Forest Floor.” I made this image this morning in response to the Daily Create challenge to think inside the box for once instead of outside the box. Again, the theme of the lost dolls in the forest spontaneously surfaces. I am on the left, contemplating their appearance once again. Yellow Bird, why do you come? I return to the theme of dolls again and again in my Mysterious Night Vision Field Journal (soon to be an online class. Stay tuned by subscribing to toucancreate.com, the website for our online art classes.). I find them deeply satisfying. 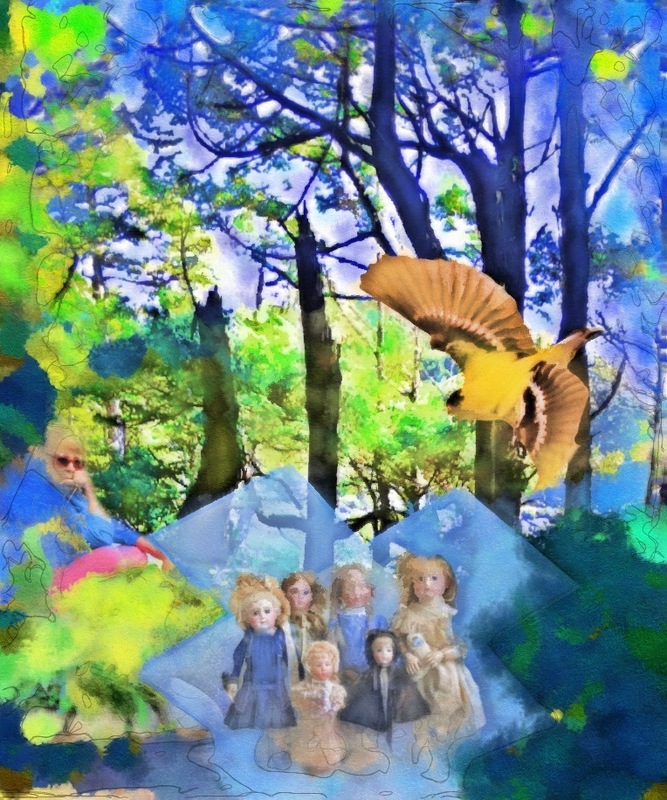 The dolls speak to me of my many interior worlds; they act out on The Doll Stage that is the theatrical doorway to the old growth forest of my mind. 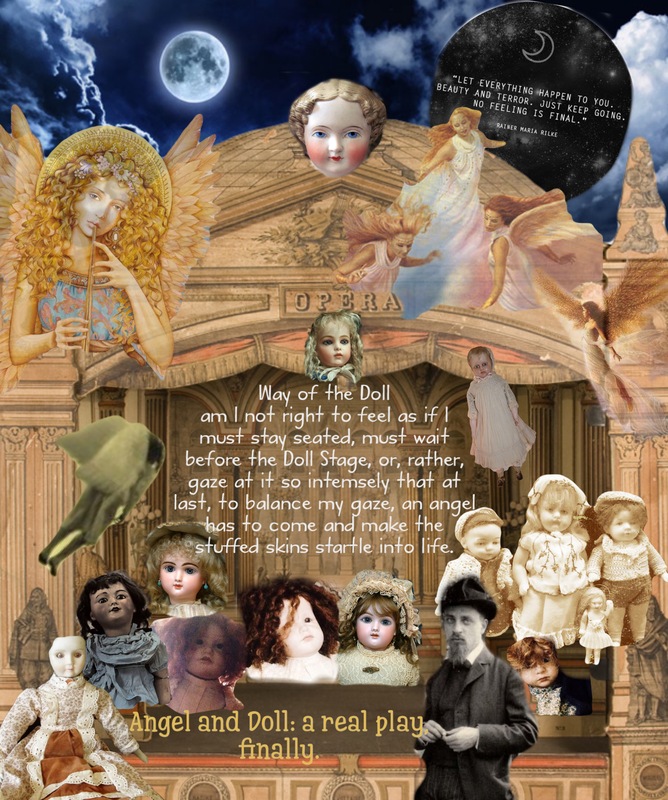 “Angel and Doll: A real play, finally.” Bazaart app for iPad. Are you a doll lover, too? Some people hate dolls and find them creepy–I will write about that next time. Is there something in your life that acts as dolls do for me, as intermediary objects between daylight and the place where you do art, that waking dream? Please share your thoughts in the comment field below, or the one at the very top of the page–between the two “The Lost Doll” titles where it says “Leave a Comment.”–I’d love to hear from you!